Non Sequitur lays it out, and I have no argument with Wiley’s analysis. Because, yeah, I have a lot of arguments. 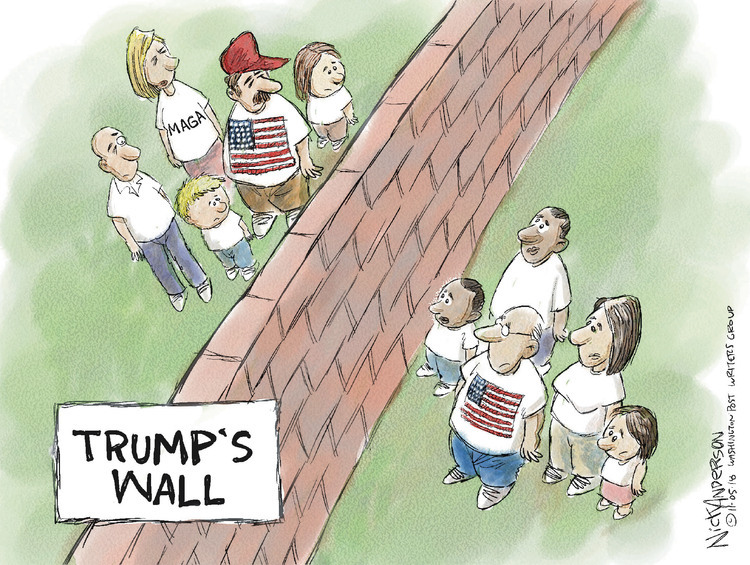 Nick Anderson says much the same as Wiley, though in a slightly different tone: Trump never got his wall on the southern border, but he’s managed to build one through the heart of the country. I’ve said before that Trump is not the cause, but the result. Put another way, he is a symptom, not the disease. But he is still the embodiment of a willingness to express things in public that decent people kept to themselves a generation ago. However, he didn’t do it alone and he didn’t do it in a vacuum and it didn’t start in 2016, and I think it’s appropriate that — as Mike Marland notes — he had Rush Limbaugh and Sean Hannity join him on stage last night to help rile up the Deplorables. I first heard Limbaugh as I was driving through rural Michigan, searching for stations on a cross-country trip, and I don’t know the date but I’m guessing it was shortly after the Fairness Doctrine ended. My reaction was that some backwoods radio station had put a local barroom braggart on the air, until I realized he was taking calls from around the country. But even this was after my own stint in talk radio, when I had learned that foolish anger generated more phone calls than earnest analysis, and I’m not just talking about my own short career. Up the hill in Denver, Alan Berg had used angry liberalism to keep the phone lines full, but he kept bouncing from radio station to radio station not because of the Fairness Doctrine but because management couldn’t take the complaints or, in one case, the critic who showed up at the studio with a handgun. Berg was eventually gunned down in his driveway by a rightwing militia group, a death memorialized in the movie Talk Radio, and his death brought forth an avalanche of media pondering, with people talking about how they had allowed this thing to happen, how Berg had been exploited for ratings. And then they found his replacement, because the show must go on. And sometime after that, Rupert Murdoch launched Fox and while the fable of frogs in gradually boiling water is not true, the fable of decent people standing by while ugliness, hatred and division gain strength and power surely, surely is. I’m old enough not only to remember that John Chancellor, of whom we could use more, did not vote, but also to remember being in the newsroom myself in the days when we were told not to wear political pins or put bumperstickers on our cars or signs on our lawns because, while it was understood that we had opinions, it was ethically necessary that we keep them to ourselves. Whether it “fooled” anyone was secondary to the constant reminder to make a genuine effort to keep our partisan feelings out of the workplace. Both Sean Hannity and Jeannine Piro took the stage last night, because, while they accuse other news outlets of being prejudiced, they felt an obligation to promote the One Great Revealed Truth. So here we are, and Deflocked lays out in four panels what I laid out in a full column 22 years ago: Mamet cannot differentiate between politics and entertainment because we have long since stopped doing it ourselves. One unfortunate change in the growth from three networks to hundreds of cable networks was that elections have become optional viewing. I don’t want to lie to the younger generation: We did NOT cuddle up on the couch with Mom and Dad and watch the election returns come in. We moaned that our favorite TV shows weren’t going to be on, and then we went up to our rooms and read or listened to music, and, the next morning, somebody told us who was going to be President. But, while we didn’t watch the coverage, we knew it was important, because the whole nation had come to a halt for the evening. Somewhere in the back of our minds, we got the message that, when we were older and more mature, when we weren’t little children anymore, it would matter to us. As noted in that old column, we no longer have a sense of community, not just in national media but in our own towns and villages. I had to shake my head over people who blamed Amazon for killing off the Sears catalog, which, after all, was just a slower version of the same corporate strategy for undermining local merchants. And it’s been years since we had “local merchants.” My kids — now in their 40s — could go down the street to Musick’s Drug Store and Lillian would make them a soda, or Jerry might give them advice on a science project. We have chain pharmacies and chain groceries and chain banks, and we’ve got chain newspapers and chain TV stations giving us chain news coverage that is just a step up from the robot radio stations that beam down satellite programming featuring disc jockeys who never mention that the sun is shining because, where you are, it may be raining or even night time. Real Life Adventures is generally a source of mild-mannered domestic comedy, but Wise and Aldrich stepped up today, and that seems more of a bellwether than the often-topical commentary of Non Sequitur or Deflocked. I was about to write “I hope we’re all angry,” but I know we’re all angry. I hope that most of us are angry about what we’ve lost, and about what else we’re in danger of losing. 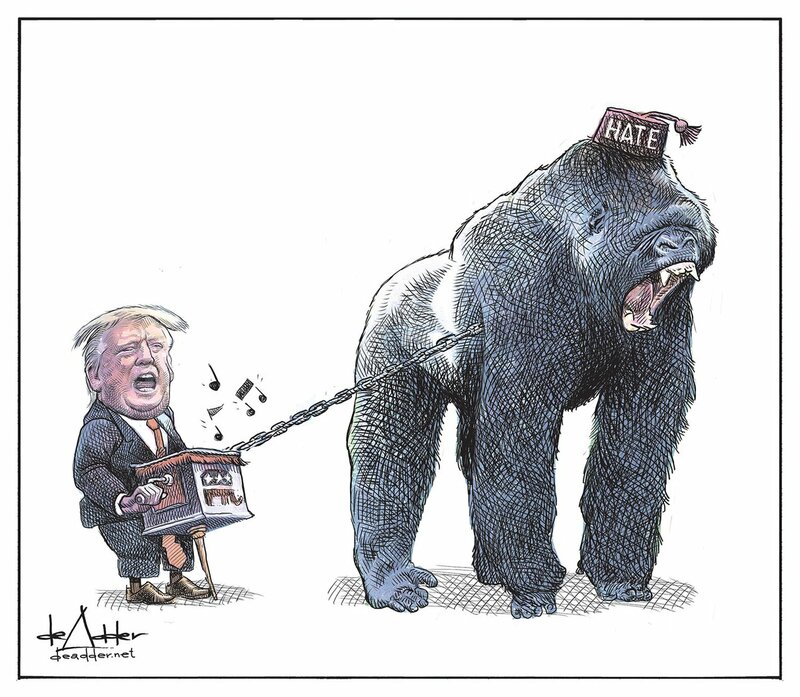 On accounta this song ain’t over, and, as Michael de Adder draws it, that monkey isn’t so little and funny anymore. I’m with Mo: Fingers crossed. Because, as the old TV commercial put it, you can pay me now or play me later. And we’ve seen what it costs when you wait until later. What with all the buyers’ remorse I’m seeing around the web from the last sideshow/election, maybe there’s a chance you Americans will get it right this time. But then, all the polls had Clinton essentially doing a cakewalk into the White House. Just got back from voting. This makes 39 years in a row that I’ve voted. I’ve never missed a November or spring primary election since turning 18. Because like you stated, when I was a kid, I was pissed that my favorite programs were being preempted, but I knew there was something important going on. So when I was 18 in 1979 I began voting each year. And have never stopped. I learned two things from that. 1) Never eat at that establishment. 2) Get the hell out of the Bible Belt as fast as possible! I, too, remember the election coverage of Huntley and Brinkley, Cronkite and Reynolds, but I suppose the networks aren’t cancelling NCIS or the Connors tonight. And now, from what Mr. Degg tells us, our corporated conglomerated newspapers are sent to bed before any election results are in. I sure hope Trevor Noah and Stephen Colbert have a moment to tell me who Wisconsin’s next Attorney General is. I don’t know about ALL of the corporated conglomerated newspapers, but the Miami Herald (FL) already sent out an email that delivery in the morning might be late because they wanted to get as many election results in the print edition as were reasonably possible. When I worked at dailies, election night was a big deal, with pizza and late deadlines understood, though, as a 9-to-5 biz writer, my job was the early “how’s it going?” coverage at polling places. I did work at a paper that put out a bunch of “Gore Wins” papers after the AP erroneously made the call, but they didn’t get out of the building. Other papers later sold their copies as “collector items” but our paper had the self-respect to quietly recycle them. It’s the unexpected late-breaking news that no longer gets covered. The gubernatorial and Attorney General races in Wisconsin went down to the wire — those two Republicans have yet to concede. The local papers here went to bed with “Too Close to Call” headlines, but the Milwaukee Journal Sentinel and Wisconsin State Journal (Madison) headline the Democrats’ victories. 30 queries in 0.165 seconds.